Hawkwind's interstellar jets are in hyperspace on this LP, the band fresh off of its filling rattling success of the live "Space Ritual" (although I've never quite been able to get into that one since the bass seems out of tune through much of it - otherwise, it is quite groovy). David Brock continues to democratize the band with the other members contributing some fine, spaced-out ditties. The band leader riding shotgun didn't work out that well for Belle and Sebastian, and it definitely didn't work for Oasis, but Hawkwind ends up all the better for it. The sound is a little brighter and more psychedelic than the last album, which is also a big plus. Additionally, the electronics fit in much better now, instead of sometimes blaring at odds with the music. The band comes out very consistent here, and all of the tracks have their high points. Of course, the classic Hawkwind sound is in full bloom in Brock's "The Psychedelic Warlords (Disappear In Smoke)" and the hard-hitting, live "You Better Believe It." 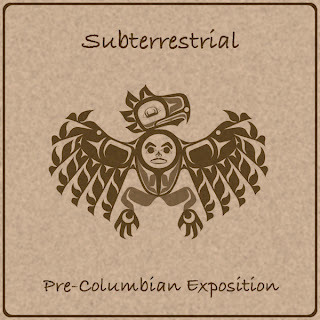 Here you get all of the pounding rhythms, acid guitar, floating mellotron, and stoned vocals you need in a potent brew. Nik Turner's "D-Rider" gives us a slightly different flavor of the Hawkwind spirit, while the title track and "Goat Willow" are fun sound paintings in minature. Of course, I've got a soft spot for Lemmy (even if it was HIS bass out of tune on "Space Ritual"), so "Poor Johnny" is notable for giving us some psychedelia in the groove while Lemmy warbles as if almost passed out on the floor, whiskey bottle in hand. The bonus tracks are live cuts from the same show as "You'd Better Believe It," and for my money this leaves us with a (give or take) 23 minutes live set that's superior to "Space Ritual." There's also a single version of "The Psychedelic Warlords," although it's not particularly essential. This is a great snapshot of the band in its mid 70's, freaky, hairy prime. I'd tell you that it's their best, but the next studio album is even better. We'll get to that one soon. So here's the deal - your mission, should you choose to accept it, is to program the monster, acid metal barrages of "Brainstorm," Lord of Light," and "Time We Left the World Today" in a repeating loop and play it until your head explodes like that dude in "Scanners." "Space Is Deep" is also a very groovy mid-tempo psychedelic number with a catchier hook that you can dance to as you pick up the clumps of grey matter from the floor. Lemmy surprises us all with his quiet, down-tempo tune "The Watcher." I guess he hadn't yet consumed his first steak and whiskey for the day. There are again some great bonus tracks following the proper album. The single version of "Lord of Light" is relatively inessential, but "Urban Guerilla," "Brainbox Pollution," and "Ejection" all find the band rockin' away at their wild, club-smashing best. Science-fiction grand wizard Robert Calvert also shows up with some songwriting credits here, so I suppose it's the start of fusing Hawkwind with the cosmic soul with Michael Moorcock (ding dang, now that's a family name to have). Almost all the pieces have fallen into place for Hawkwind on this disc. 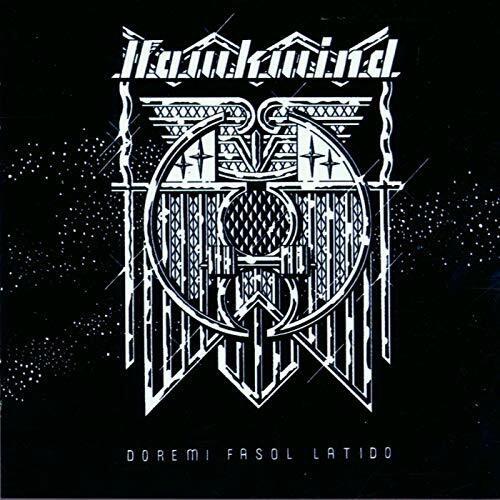 The band brings it all together on their next couple releases, but "Doremi Fasol Latido" is still solid enough to earn a spot as one of Hawkwind's first classic album. If you want to travel interstellar space as loudly as possible, then these are your old school homies. *This is a repost from a year ago - I've done a bit of editing to my review as we're now considering the bonus tracks on the CD as well. 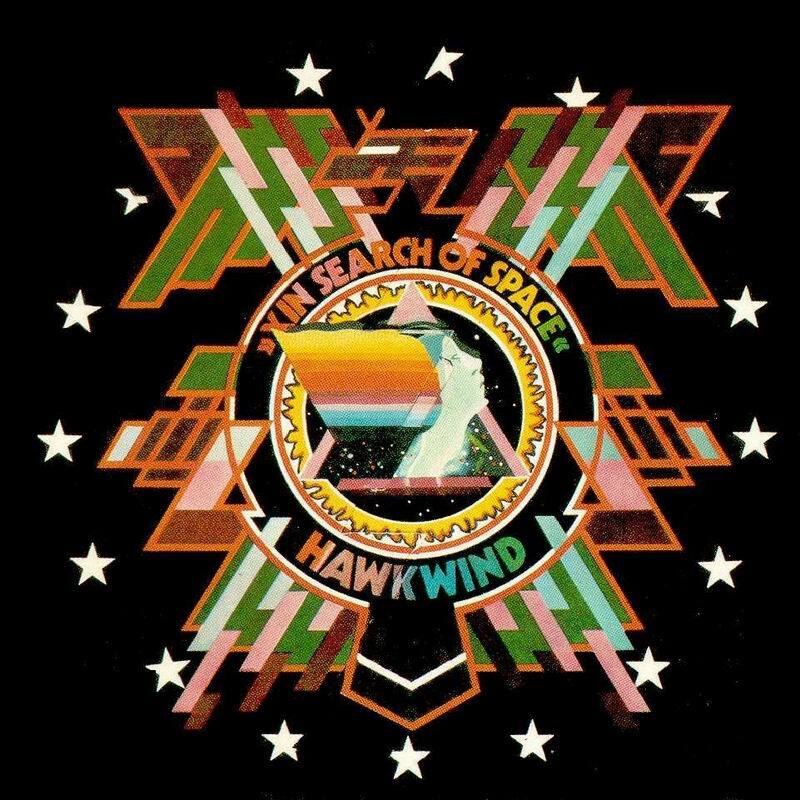 Hawkwind has a giant, intimidating discography, and I have to admit that I haven't delved too deeply into it (well, maybe now I have) . I do know that I dig this album quite well. The live "Space Ritual" typically gets the love, but I find the sound on that one a little muddy, and Lemmy's bass seems to be out of tune for most of the album (not that this detracts from the awesomeness of Lemmy). I dig the slightly more focused, and better recorded intergalactic musings found here. The band has no problem entering a full on psychedelic heavy metal groove, and there are plenty of wild early synth sounds to keep my attention. The album opens with the punk rock stomp of "You Shouldn't Do That." 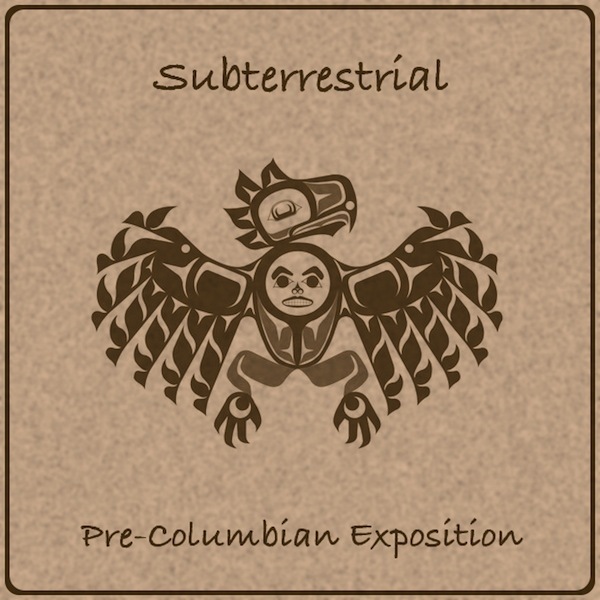 It's an absolutely essential track with plenty of wah-wah acid guitar, wild saxophone madness, and some electronic tones to penetrate into the deepest recesses of your brain. This is all capped with some great breathless vocal 'harmonies' making the song's title a mantra. Yeah, it's 16 minutes long, but that may very well be too short. The other classic on this disc is "Master of the Universe," which I suppose is the band trying to usurp Black Sabbath's claim of the title "Master of Reality." I don't know if they quite take down Ozzy, but the psychedelic sludge is a pretty even match and Tomy Iommi probably would have killed all of Hawkwind to steal the guitar riff if he had had the chance (dammit, I need to write about heavy metal more often). "We Took the Wrong Step Years Ago" is a meditation on if the band had focused on progressiv bluegrass I suppose, while "Adjust Me" is a wandering experiment that doesn't quite pay off. The CD adds some pretty worthy bonus tracks with the addition of the "Seven By Seven/Silver Machine" single. "Silver Machine" in particular finds the band with their atomic thrusters at full blast, heading directly into the sun of Ceti Alpha 5. It's a perfect mindstorm of psychedelic heavy metal. There's also a live take of "Born to Go," which captures the band at their pre-Lemmy punkiest. At this point Hawkwind was sitting a point right in the middle of progressive rock, heavy metal, and psychedelia, and it was a pretty groovy place to be. 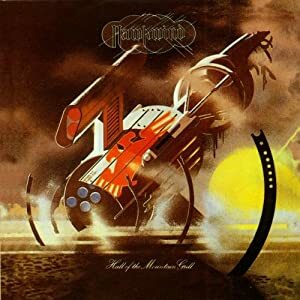 I don't know if this is really Hawkwind's best effort, but it is one that I find myself listening to over and over again. Y'know, especially when you start here, the great Hawkwind does come across a bit like the real life Spinal Tap. Well, except Spinal Tap never had Lemmy in the band as Hawkwind did for a while. Unfortunately, you won't find Lemmy on the primordial beginnings of Hawkwind found here. We've got a spotty album under the microscope, but the best moments shine brightly. At this point, Dave Brock is completely in the driver's seat with songwriting credits on every track and he tries on a few different sounds for size. Some of them work better than others. The album starts with the folk-rockin' potboiler "Hurry On Sundown," which may very well turn people away as the sound doesn't really jibe so well with the band. Let's face it, Hawkwind probably goes near the bottom of the list of bands that should go unplugged. No, instead give your attention to the astral noise chamber of "The Reason Is?," which is a much better album opener. This gives way to the band's first great long-form psychedelic rave up, "Be Yourself." It's a touch more restrained than the band's signature blast from a few years later, but the pounding rhythms and acid, freak-out guitar make up for it. I've always assumed that they were trying to recreate the sound of a 'hawk wind' on these tracks. The two parts of "Paranoia" make up the next mini song suite, and while they're perfectly enjoyable, they sport another experimental dead end for the band (and the main riff is annoyingly similar to the Doors' "L'America"). "Seeing It As You Really Are" drags on a bit too long, but "Mirror of Illusion" is fun - coming across like Syd Barrett's Pink Floyd playing "Ballroom Blitz" after someone tried to describe the song to them but neglected to play it. Speaking of the Floyd, "Kiss of the Velvet Wind" out in the bonus section seems like Barrett on serious downers, and there's a ramshackle cover of the Floyd's "Cymbaline" closing out the reissue. 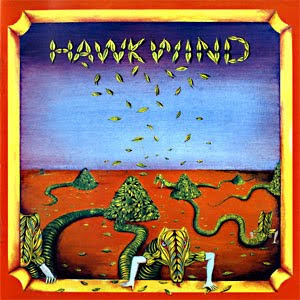 Although the cover art is absolutely groovy, this is not really the best place to start with Hawkwind. They're still getting their poopy together here. For those already indoctrinated into the psychedelic metal, sci-fi celestial sphere of Hawkwind, you'll find some prime moments liberally sprinkled over the music of a band that hadn't quite discovered the true character of its space cadet soul. So, here's another one of those mind-blowing, movie-length drones. You know, the kind that Jeff Bridges 'Dude' would go for while getting stoned in the bath tub. This one got the hooks in my nose straight way from the concept. I've got a history degree in my back pocket, and I've always got an eye out for books documenting the pre-Colombian civilizations of the Americas (ask me about the Mayans sometime!). The same motif drew me to the recordings of Jorge Reyes a few years back, but this disc may very well be better. Although sometimes teetering on the brink of new age (find the wooden flute around 48 minutes in for your litmus test), I think the sound here mostly sticks to the 'musical shaman' aesthetic. You have one track here, and it runs for the entire length of the CD. Most of it is walls of synth sound, but you'll find your bird noises, rain sticks, and aforementioned wooden flute adorning things here and there. Again, half of my readers will probably find this massively absorbing, while the other half may want to file this along with the pan pipes of Zamfir. I'm going to go ahead and vouch for the thing, though, and declare it a 'song of psychedelic insanity' (maybe 'psychedelic meditation' would be a better nomenclature). I have to admit, however, that I used to spend a fair amount of time trolling around in places like The Nature Company and The Discovery Store back when I was a young buck. You can't tell me that you don't like screwing around with the rain stick, though. Can you? 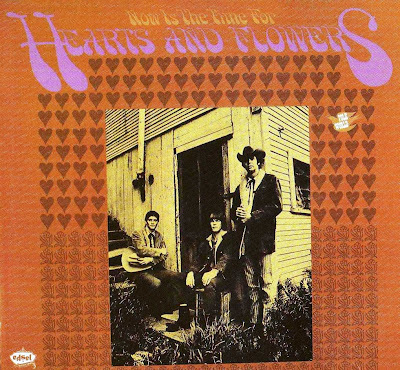 Hearts and Flowers were a group of musically-inclined time travelers who arrived in 1967 from the futuristic year of 1970 in order to attempt and make the world a groovier place. Yeah, the more likely story is that this So-Cal band was just a touch ahead of its time, but they do so in such strangely specific ways. Sure, the early Byrds and acoustic folk music are pretty obvious influence, but how is it that they seem to channel the sounds of the later Byrds, Crosby, Stills, and Nash, and and late 60's-early 70's L.A. hippy cowboy rock in 1967? I suppose that we'll leave that one to the quantum physicists, and turn our attention to this stellar set of psychedelically-tinged country rock, which comes straight at you dressed in a sonic Nudie suit. A few months ago, I reviewed a few Beachwood Sparks album and noted their clear affinity for the Byrds and Gram Parsons 'cosmic American music,' but now I'm thinking that that band simply had a few Hearts and Flowers tracks stashed away in the more secretive layers of their brains. Hell, as much as I dig Gram Parsons, I think these guys are a better fit for the whole 'cosmic American' thang. It could be their harpsichord that seals the deal. This plays as a great complete album. None of the tracks are duffers. The folk influences infuse "Try For the Sun" in a purer way that most rock bands tend to muster. "The View From Ward Three" provides us with a country two-step, a quivering fiddle, and a touch of psychedelic guitar in a very groovy mix. Head for "Rock and Roll Gypsies" or "Save Some Time" to hear these guys vocally predict the Crosby, Stills, and Nash blend. "Please" sounds sort of like the Byrds if they were led by Lee Hazelwood, which turns out to be a pretty fine idea if you accept this tune as evidence. While we're on the topic of the Byrds, "I'm A Lonesome Fugitive" would've fit right on their "Sweetheart of the Rodeo," which didn't see release until a year later. While they don't betray their earthy roots, the band save their most psychedelicized blast of sound for the closing "10,000 Sunsets." I don't know why I've never come across this band until recently. It's a pretty top shelf collection of hazy country rock. They certainly had the game down ahead of some of the A-listeners, and most of these tunes are pretty much in the same league as those more famous folks. I'd definitely be willing to grant this one a 'lost classic' status. There's apparently a second, more psychedelic pop album from a somewhat different line-up of the band as well, although I've yet to hear it.